I bring this up by way of explaining why I have never been a big pound cake fan. Having tasted them mostly from the aforementioned dessert platters, I always assumed pound cake was inherently kind of boring. Leaden, dry, and plain. Why order the pound cake when there is…anything else to be had on a dessert menu? 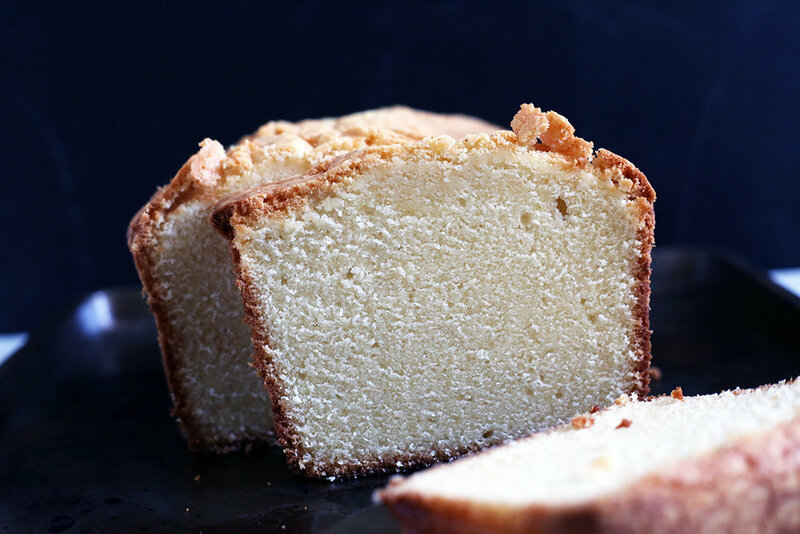 The key to making yourself—and everyone you know—fall in love with pound cake is to not overbake it and to really, really, really beat the HECK out of the batter during the creaming stage. A proper pound cake is very tender, moist, and dense—but dense doesn’t equal heavy. The texture of a good pound cake is what I would call “plush” or perhaps “velvety”. It’s close-crumbed, but if you cream the butter, sugar, and cream cheese together thoroughly enough (getting plenty of air into the batter at that step), you’ll create a cake that manages to be both dense but delicate at the same time. Then, of course, you want to be sure not to bake the cake for too long which will prevent it from drying out. My final trick (ladies and gentlemen, drumroll please….) is: fiori di Sicilia. This extract is a blend of citrus and vanilla flavorings that’s typically used in Italian desserts, so you’ll recognize the flavor most likely. I think of it as a little like the taste of a creamsicle. If you’re thinking, “can’t I just use orange zest and more vanilla extract?”, the answer is yes, but it won’t have quite the same allure as fiori. There’s something particularly specific about the balance of flavoring in the extract that’s hard to replicate. I like to use it in all sorts of recipes, from sugar cookies to pound cake. If you only add a tiny bit, you won’t really taste it but it adds a great depth of flavor to what is otherwise a simple and somewhat plain cake. Think of it like vanilla: it adds complexity to baked goods, even if they aren’t vanilla-flavored, per se. Preheat the oven to 350 degrees F. Grease an 8 1/2” x 4 1/2” loaf pan. In the bowl of a stand mixer, beat the butter and cream cheese until very light and fluffy, about 3 minutes. Add the sugar and beat for an additional 5 minutes. Do not skimp on this step! You want the mixture to be very, very fluffy-looking, which will give the cake a good crumb and texture. Add the vanilla and fiori di Sicilia (or orange zest and more vanilla). Turn the mixer to low and add the flour and salt, mixing until the batter just comes together. Pour the batter into the prepared pan and bake for 60 to 70 minutes, or until a tester inserted into the center comes out clean or with just a few moist crumbs. Let cool in the pan for 10 minutes before turning it out onto a wire rack to finish cooling.